The South Carolina polling continues to show a substantial lead for Obama, while Edwards' rise hints that he could challenge Clinton for second place. At the moment, Clinton continues to hold a six-point advantage over Edwards, but Edwards has been rising while Clinton has been moving down. Obama, meanwhile, has been fairly steady at around 40-44% support, though with some hint of a small decline in the sensitive estimator. Note however that the Clemson University poll included here had an amazing undecided rate of 36%. That makes every candidate in their poll look lower than in all other polls that have a much lower rate of undecided. The level of undecided is quite sensitive to how the poll is conducted, including whether respondents are pushed as to whether they "lean" towards a candidate. The Clemson poll apparently didn't push at all among undecided voters. We'd be making a mistake to read their data as indicating a decline of support for anyone. 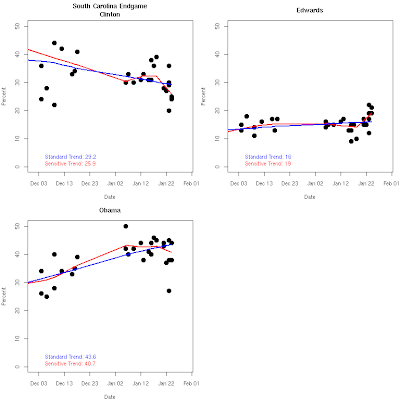 I think the more compelling story of South Carolina will be the exit poll results. Obama has appealed to white voters in previous primaries and caucuses. The pre-election polls have found him getting as low as 10% of the white vote in South Carolina. The potential for racial polarization in this Southern state could damage his ability to transcend race as a basis of voting. Paradoxically, there has been speculation that Clinton can win the votes of black women, a result that could reduce polarization in the exit poll. We'll know much more about how voters decided by Saturday night.